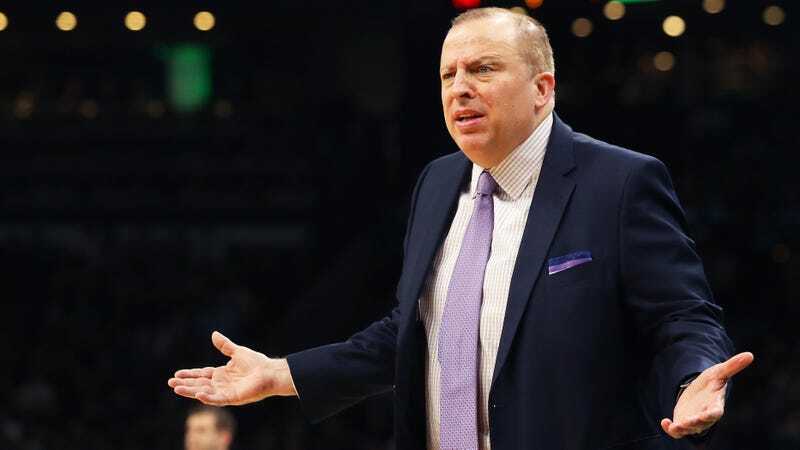 The Minnesota Timberwolves have fired head coach and president of basketball operations Tom Thibodeau, according to the Athletic’s Shams Charania and Jon Krawczynski. Assistant coach Ryan Saunders will serve as the team’s interim head coach for the time being. Ever since Thibodeau allowed the Jimmy Butler saga to metastasize earlier this season, the coach’s exit from Minnesota seemed less a matter of if and more a question of when. The Timberwolves decided they were done waiting. Krawczynski reports that the firing happened when it did because management didn’t think Thibodeau had done well enough as coach with the post-Butler roster. Since shipping off Butler to Philadelphia, the Timberwolves have gone 15-12—the same record as the Golden State Warriors over that stretch—but Thibs was still Thibs, and still playing starters brutally heavy minutes. The Wolves sit at 19-21 on the season, good for 11th in the Western Conference and bad enough that management began to feel a sense of urgency about making a change. “Urgency” can in this case be interpreted to mean both competing for the postseason this year and making sure that the team’s young stars can still walk by the time the playoffs arrive. As one might expect with a team that cited urgency as a factor in its decision to can its coach, names of candidates have already begun to roll in. One in particular stands out. It turns out Minnesota’s commitment to the Timberbulls meme will likely go beyond the Thibodeau era.